You are ready to start receiving customized home care. How do you get started? Retire-At-Home in Toronto, East York and North York is a company of trained and experienced Home Care Specialists. By calling us for your home care needs, we will walk you through a step-by-step process to help you understand your options, customize a care plan that meets your needs and budget, and ensure you are comfortable at each stage of the process. Here is some information on how we get started! After calling Retire-At-Home Services Toronto and North York, we will meet with you in your own home to get to know you and to familiarize ourselves with your care needs. We will also provide a detailed description of our customized service and answer any questions you may have. At a time that is convenient to you, our Registered Nurse can provide a full medical assessment to further determine the customization of our care. 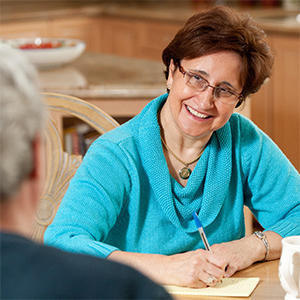 Working with your input, we will define the ideal caregiver(s) to implement the care plan within the agreed upon schedule. Feeling nervous about getting started? That is natural. At the beginning of the first shift, we will come to your home to present you with your caregiver. We will stay with you for a friendly introduction, making sure everyone is comfortable. For on-going quality control and monitoring, we will regularly check in with you and ask you how you and your family feel the caregiving is going. We also ‘pop by’ on unplanned supervisory visits to ensure the care is going as directed, and that everyone is content. We want to exceed your expectations, and we welcome changes and modifications to suit your needs and desires. Contact us today for a Free In-Home Consultation with a Nurse, or to find out more about your Home Care Options in Central Toronto, Toronto West, East York and North York. Bayview, Bloor West, Bridal Path, Casa Loma, Don Valley ,Don Mills, East York, Forest Hill, High Park, Leaside, Leslieville, Playter Estates, Riverdale, Rosedale, The Beaches, Toronto – Downtown, Toronto – Central, Toronto – North, The Danforth, York Mills, Yorkville and other surrounding communities.